Headhunter is an authorized dealer of Blue Water Desalination Watermakers. 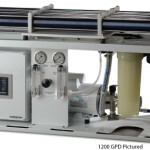 Blue Water Desalination offers three distinct lines of watermakers to suit the needs of the most discerning mariners, from the day fisherman up to the long-range sailor and transoceanic yachtsman. Within the three lines, Blue Waters offer dozens of models of varying capacities in both frame and modular style configurations.